Now after stashing my gear under the watchful gaze of Mr. Elk who wanders off to untold forage sites and forgets to tell me later where I hid my gear leading to another afternoon or night search grid, I am off to town. I may or may not have an odd job to do. So far I have repaired a roof, cleaned chimneys, built porch posts, fixed tables, built firewalls for wood stoves, and of course the great horse fiasco. So with no work today, I head to the Cafeista. 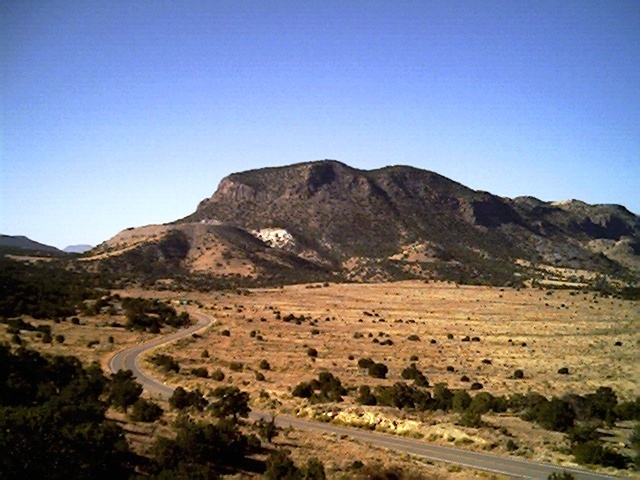 This being Northwest New Mexico, everything has the Southwestern flair to it. It is a Starbucks like shop with Wi-Fi. It will be here where I recharge the batteries ( I carry 2 with one being short carrying a charge these days). Here I am writing a few of these articles as well.The day begins with me also trying to chase those down that owe me money for the above jobs. Its amazing how sometimes you finish a job and the employer suddenly does not have the money to pay. Oh well that is part of life’s problems isn’t it? I do some shopping for food. I eat my meals in town or somewhere between town and the campsite. The coyotes are a big problem. They travel in packs. You do not want them circling your camp as it will lead to a sleepless night and Mr. Elk refuses to deal with it. Also forget the Survivor Man crap about hanging the food in a tree, out here the trees are only about six to seven feet tall and are more like bushes. It is not cheap being homeless. You have to buy everything you need on a daily basis. I carry empty water bottles and fill them where I can. That means I have to resupply on a daily basis. I tend to eat a mid afternoon or late afternoon meal only. Sometimes I will have a morning snack. But what I find I crave most are liquids. That is the source of my survival as the day is constant movement. I do laundry approximately every fifth day. Laundry day I move in the dark for this and do my battery charges in the laundromat. Small town hotels are more laid back also. Where once the signs said we have HBO on them they now say we have WI-FI. Now these people are not the big commercial hotels with desk clerks on 24 hour duty. They are not guarding their broadband! They are not issuing 5 or 13 digit pass keys for their networks. These are unprotected networks since they do not want themselves woken up at Two in the morning because Mr. Jones in room 2 cannot get on the Internet. I just turn on my laptop and find the strongest signal and roam the Internet. Sometimes I sleep during the day and find a good place to sit in town at night. Small towns are ok and relatively safe if you stay out of sight. The one thing about old construction also was, we always used to put external outlets on our buildings for electrical devices as opposed to newer construction. When I am walking around during the day I tend to case buildings for these outlets to save my batteries. You have to watch out at night though, Mr. Jay likes to sit on the edges and bomb you as sit under the buildings as his little night joke. Always check the eaves of the buildings! I have been surprised before. Oh the woeful lessons learned! Then it is back to camp, passing the prison wondering if the bed check turned out ok, and wondering if the guards there might be thinking “Hmmm we better count again” upon seeing me outside their fence. Back to Mr. Elk who is gearing up for another exciting episode of “Lets Find The Back Pack” his favorite game show. And thus another day begins and ends. Ps. Mr. Elk has moved on. Hopefully he made it ok. I am also moving towards a different area. Hunters have come through the area since the writing of this. I have felt Mr. Elk came from the “other side of the racks” since he was not hanging out with a herd. Good Luck Mr. Elk. When you find you can’t use that “short charge” battery any more, you might try letting it run completely down as far as your laptop will allow. Then give it a full recharge. These things tend to develop “memory” if constantly partially recharged and sometimes you can get more life out of them by deep discharge and then full recharge to erase that memory. Don’t count on it though. Do not short them out (they may explode) in an attempt to get a deep discharge. Keep them in shade or as cool a spot as you can manage during hot weather to preserve your charges – no problem at the moment, I’m sure! I have occassionally found that homeless have pulled the cover off the distribution boxes (not the switch boxs) on commercial buildings and tried to get at the power – luckily no bodies yet! I guess they were trying to run a space heater – extremely dangerous. There was an outlet on the other side of the building but it was a bit exposed to onlookers. We took in a young man that took a job and was transported to another area some 30 miles away, dropped off with some drywall mud and tools and left there for 3 days – no furnature, no money, no food, no cell. After they picked him back up, they dropped David off where they found him and never paid him. We tried but could not get the guy to pay him, claimed he did not do the work – no witness. He still lives in a house that my daughter owns, does odd jobs and day labor to pay a small rent, food to eat. Everyone should hit Oldtimers site. Just scroll his name and go there. He is inspirational to me and he is a far grander insight to facts, homelessness, spirituality, and news than I am. He gives me great advice, wisdom and I look forward to his comments and guidance when he deems it. He is a great asset to this website. I know what you mean about doing work that you never get paid for. It’s amazing how many people want the homeless to get jobs, but when it turns out the only jobs they can get are “side” jobs, so many of the “regular” people have absolutely no problem taking advantage of a homeless person who is just trying to put a few bucks in the pocket. Wanderingvet: I think you’ve been leading too many coyotes in harmony sessions. Thanks for the compliment but I’m the novice around here. You are the expert and I look to you on how to survive. I admire and enjoy your writing too. Well I think the real experts have left the scene because I cannot find any left! I just sort of fumble through this trial and error. I leave out so much like prairie dogs live in the bottom lands and cannot dig in mountains, ants prefer sunlight so camp in shade etc. One day hopefully I will not be the leading expert in this field.